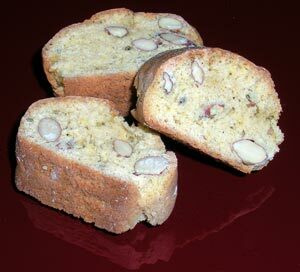 italian cantuccini are crunchy (they are baked twice so they dry out) almond biscuits, traditionally from tuscany. having bought many different types over the years i thought it was time to try making my own. dried lavender from my friend liz’s garden provided me with the flavour inspiration i needed. these biscuits are usually served with coffee or sweet wine. i prefer these with sweet wine, not least as this really brings out the orange flavour. combine the flour, baking powder, ground almonds, sugar, orange zest and lavender in a mixing bowl. beat the eggs with the vanilla and honey and then add to the flour mixture. using your fingers, stir the mixture so that the flour and eggs start to combine and form a dough. if it is too sticky add a little more flour. transfer to a floured surface and knead the mixture until you have a smooth, non-sticky dough. then work in the whole almonds. split the mixture into 3 and form into logs c3cm wide. place these on a baking tray lined with non-stick paper. they will spread out as they cook so you need to leave space between them. bake for 20 minutes at 200c. take out and leave to cool, then cut into 2cm thick slices. spread the slices on the baking tray, standing up if possible so both cut sides are exposed. bake for another 15 minutes until they are dry and slightly browned on the edges. leave to cool on a wire rack. serve with something to dunk them in.